White shorts, with red drawstring. Red triangular shard at bottom of each seam, extending inwards, rising to a point and continuing along hem around rear half of shorts, before narrowing to a point. Large red triangular shard extending down from waistband at top of each seam, extending outwards and ending in a point. Two embroidered navy blue concentric diamonds on left thigh. Navy blue number, in the same font as on the shirt, above the Umbro logo on left thigh. Embroidered emblem on right thigh, with 'ENGLAND' in capitalised white lettering inside a navy blue panel above the emblem. Red socks, with darker-red soles. Two large white concentric diamonds on calf. Emblem on shin, underneath the Umbro logo, with 'ENGLAND' in capitalised white lettering inside a navy blue panel above the emblem. Peter Crouch came on as a substitute against Uruguay and scored the equaliser wearing number 21 on the front of his shirt and number 12 on the reverse! As Luke Young on the bench had the number 12 shirt, Crouch's number was officially 21. The shirts worn by Gary Neville also included his first initial i.e. G. NEVILLE. The shirts worn by Ashley and Joe Cole against Jamaica and Sweden also included their first initial i.e. A. COLE and J. COLE. 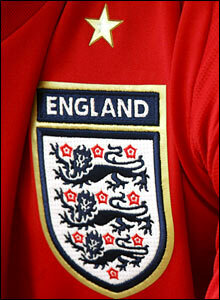 Against Sweden, England had a full-colour FIFA WORLD CUP GERMANY 2006 logo heat-pressed onto the upper right sleeve. Against Estonia, England had the UEFA EURO 2008 logo heat-pressed onto the upper right sleeve. The names of England's opponents, as they appeared in the match details, were ESTONIA, GREECE, JAMAICA, SWEDEN and URUGUAY. England were named first in the three home fixtures and second in the other two fixtures. 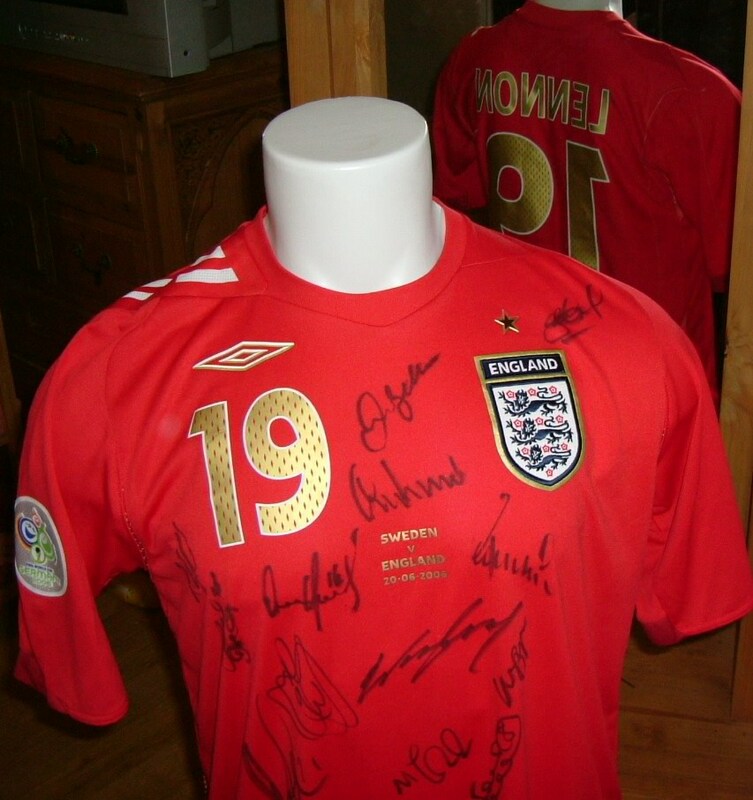 For the two fixtures played in this shirt in the 2006-7 season, against Greece and Estonia, John Terry, England's captain, wore a white armband, with the fixture, the name of the stadium, and the date, all printed on it in red, with the emblem also on it. 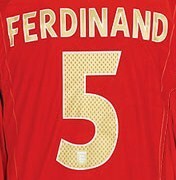 26 players appeared in the five games in which this kit was worn. Even though Terry started all five games and Crouch started two of the games on the bench, it was the striker who spent the longest on the pitch in this shirt. Terry was substituted at half-time in the first game (versus Uruguay), and was taken off in the first half, because of an injury, in the second game (versus Jamaica). Crouch's second substitute appearance in the shirt was in the fourth minute, against Sweden, because of Michael Owen's serious knee injury, which meant that Crouch was four minutes short of four full appearances in the kit. Darren Bent and Aaron Lennon were the only players to make their international debuts in this shirt; Lennon as a 19-year-old substitute against Jamaica, who went on to make 21 appearances. No players won their last cap in this shirt. Seven goals in five games was a phenomenal record for Crouch, who only failed to score against Sweden. Crouch's hat-trick against Jamaica could have been clinched seven minutes earlier, had he not fired over the bar from a penalty. Crouch was also the only player to score his first international goal in this shirt, coming on as a substitute to draw England level against Uruguay. No players scored their last international goal in this shirt. Beckham relinquished the captaincy at the end of the 2006 World Cup. Terry captained his country for the first time in Steve McClaren's first match in charge, a thumping 4-0 victory against the European Champions, Greece. Terry became the first England skipper to wear the match details on his armband. After the silver-edged red shirts and shorts of 2004, England upgraded their next change kit to include gold markings in terms of names, numbers and match details, though, thankfully, the shorts were not gold. Kitted out with gold, our heroes were now ready to take on the world once more, and, it has to be said, their performances in this shirt, were pretty impressive. Unfortunately, their victories were largely meaningless friendlies. Their only World Cup appearance in the kit, against Sweden, began with a horrific knee injury for Michael Owen, but was followed by a stirring first-half performance, the highlight of which was a stunning volley from Joe Cole, which threatened to ignite England's tournament. Sadly, England were guilty of sloppy defending in the second half and the game was drawn. It was enough to win the first-round group for them, but they failed to re-ignite the spark and another quarter-final exit on penalties was awaiting them. The victory against Greece showed that there was still fire in the belly, before the shirt's last appearance in Tallinn, where Beckham and Owen made their competitive comebacks, following a year out of the fold. It was particularly pleasing to see Owen score again, following his injury, with Beckham also re-establishing himself and closing in on a century of caps. Alas, the appearances in this red and gold shirt were not matched by those in the white.